Water is the central attraction of many Texas state parks - often just a lake, with no special interest beyond general fishing, boating and swimming, but Pedernales Falls is much more dramatic. The park contains 8 miles of the Pedernales River as it meanders through the limestone hill country of the Edwards Plateau northwest of Austin, and includes the falls where the waters drop 50 feet over successive limestone layers via an impressive series of cascades and pools. The river flows through a shallow, rocky canyon past much pleasant scenery and plenty of places to explore - the park also has hiking trails, swimming pools and abundant nature. Pedernales Falls State Park is not reached by a main road, although it is just 10 miles from the well travelled US 281 route which begins at San Antonio and travels due north all the way to Wichita Falls near the Oklahoma border. FM 2766 from Johnson City passes the park entrance, from where a short spur road crosses a wooded plateau and descends towards the river, past the obligatory visitor center, picnic area and gift shop. An alternative approach is from the south, along FM 3232. All the surroundings are lightly settled, consisting of woodland, meadows and occasional fields. The park is quite large although the river is easily reached at just two places - the viewpoint of the falls themselves and an area downstream. 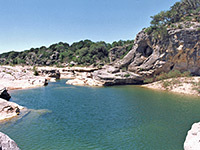 Pedernales Falls are best during the rainy seasons in fall and spring but worth seeing at any time of year. There is one main cascade with several pools and deep channels just upstream, and a large, deep pool beneath. An easy path leads down to the river, at which point wading and swimming are not allowed to protect aquatic life, a rule that seems often not to be obeyed. The underlying rock is porous and some of the water sinks below ground, re-emerging as several clear springs at the edge of the canyon beneath the waterfall. An interesting half day hike is to follow the valley downstream, exiting at the second river access point after about three miles - the 'Beach Area', reached by a separate road. 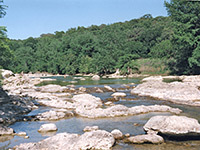 Swimming is allowed here, and the Pedernales alternates between pools several feet deep (seasonally dependent) and faster flowing sections with boulders and small rapids. This being the Texas Hill Country, the area is good for wildflowers and blossoming cacti - in spring the meadows and forest clearings above the river canyon are filled with blooms of many colors. 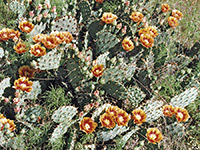 Most widespread are several types of yellow and orange opuntia, and different shades of lemonmint. A few longer paths wind through this land including the Wolf Mountain Trail (7.5 miles) which crosses several small creeks and circles round two hills in the south section of the park, generally away from the river. There is a primitive camping area along here, on a plateau overlooking the river canyon. The nearest places with hotels close to Pedernales Falls State Park are Austin (40 miles), Burnet (46 miles), Johnson City (10 miles) and Marble Falls (30 miles).